PROFESSIONAL QUALITY: Paint Scrapers that get the job done with a superior finish. Makes repair and refinishing jobs quick and easy. ONE TOOL WITH MULTIPLE USES: Tools can be used as a paint scraper, screwdriver, paint can opener, hammer, crown molding remover, putty knife, box opener & more. One scraper blade replaces multiple hand tools in your toolbox. STAINLESS STEEL BLADE: Straight-ground blades for flexibility and carbon steel blades, hardened for durability. Rust-resistant steel blade. COMFORTABLE AND DURABLE: Soft grip designed to last for long jobs without discomfort to your hands. LIFETIME GUARANTEE: No worries here, if something happens to your set, return them, and get a brand new set! LIFETIME GUARANTEE: No worries here, if something happens to your set, return them, and get a brand new set! The Red Devil Ergo EZ Grip 7-in-1 multi-purpose painter tool works as a scraper, a spreader, a gouger, a putty remover, a paint roller cleaner, a nail setter and a nail puller. With an ergonomically engineered handle designed to decrease hand fatigue, this multi-tool increases leverage, control and productivity. The full tang, stainless steel blade run the entire length of the handle and is perforated at five critical points. Molded into the handle, the blade eliminates ordinary rivets to create user-friendly, virtually indestructible tool. Flex broad knife. For light-duty construction or home projects. Spring stainless steel blade. Easy spreading and cleanup. Rust-resistant. Polypropylene handle resists thinners and solvents. Easy spreading and easy cleanup. For light-duty construction or home projects. Large hang-hole size. 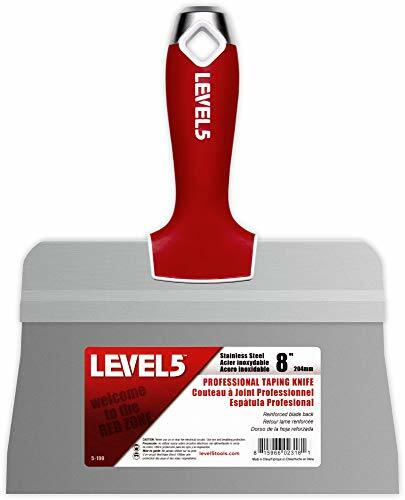 Level 5 drywall tools are premium grade, perfected for both the professional and for home improvement DIY projects. This putty knife is designed and built using nearly 20 years of input from professional finishers. BLADE CARE - Blade coated by a rust-protective laquer for storage and shipping, this will come off on first use and they will be susceptible to rust. - After each use, wash thoroughly and coat with a protective lubricant like WD-40. - Stand upright after washing to allow the water to drip off and let the blades air dry. KEY PRODUCT FEATURES - Wider, thicker, and stronger blades in comparison with traditional designs. - High quality blue steel for precise flex. - Strong, lightweight composite handle. Ergonomic design helps reduce fatigue. - Metal hammer end for setting drywall nails. - Stay organized. All Level 5 hand tools feature large hang holes. Buy this Level 5 knife and compare for yourself. We back all of our tools with the best warranties in the industry and they are guaranteed to exceed your expectations. PRODUCT WARNING LEVEL 5 precision blades are sharp. Please store your LEVEL 5 putty knives out of reach of children! ABOUT LEVEL 5 TOOLS A proud, family-run company based in Kansas City, LEVEL 5 Tools has been perfecting its line of drywall tools since 2001. At LEVEL 5, we do business the old fashioned way: zero compromises in quality, fair prices, industry leading warranties, and the relentless pursuit for 100% customer satisfaction. Our extended family includes thousands of professional finishers throughout North America and abroad. Their livelihoods depend on the quality, performance and reliability of our drywall products. Through their valued feedback and a culture of ongoing research and innovation, we make tools that make their lives on the job easier, more efficient and ultimately more profitable. PREMIUM BLUE STEEL | Blue steel provides the unique flex and feel professional finishers know and love. These blades do rust--check out the description for a care guide on how to treat your blade. If this concerns you, check out our Stainless Steel blades! PRO-GRADE CONSTRUCTION | Perfect, precise flex for a better finish and faster application rates. Features a rigid anodized backplate that is wider and thicker than competitive models. GUARANTEED PERFORMANCE | Our finishing tools are developed by professionals for professionals and guaranteed to exceed your expectations. If for ANY reason you aren't pleased with your purchase, returns through Amazon are easy and free. Buy these DEWALT Hand Tools and compare for yourself. We back all of our tools with the best warranties in the industry and they are guaranteed to exceed your expectations. If for ANY reason you don't agree, returns are easy and free. PRODUCT WARNING DEWALT blades are sharp. Store your knives out of reach of children! One of the difficult tricks to a good drywall taping job is getting the right amount of the mud on the tape. Too much or too little and it just won't stick right. 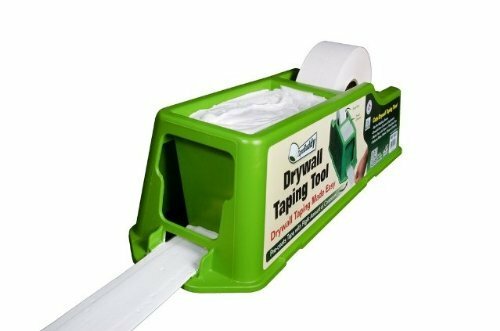 Tape Buddy eliminates this issue by pre-loading the perfect amount of drywall mud onto the tape - saving you time, money and effort. In fact, only the TapeBuddy applies more compound to the center of the tape where more compound is needed most. There is no need to pre-mud drywall joints or work with heavy, bulky equipment. Tape Buddy is lightweight and inexpensive, making it the perfect solution for those difficult drywall taping jobs. It will stand up to years of rugged use because there are no moving parts, and it's made of high density poly-ethylene plastic (HDPE). Comes with full instructions and a tips & tricks sheet. Tape sold separately. PRO SERIES TAPING KNIFE SET WITH MATRIX STYLE HANDLES + FREE MUD PAN MIXING BLADE - Comfort, control, balance and perfect flex make these the best knives you'll ever use. 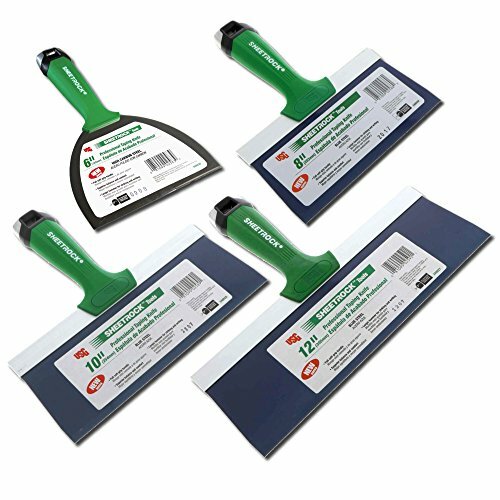 FOUR KNIFE SET COVERS ALL PHASES OF FINISHING - 6 blade is ideal for bedding tape and tighter areas. 8, 10 and 12 blades cover all first, intermediate and finish coats, skimming and feathering. 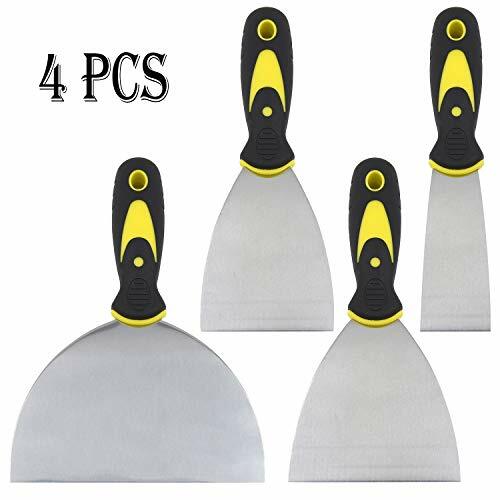 4 Pieces Stainless Stell Drywall Taping Knives Set,1.5/3/4/6 Inch Putty Knives, Wall Scrapers with Comfortable and Anti-slip Handle. 4 PCS best combination taping knifes set included: a 1-1/2inch, a 3inch, a 4inch and a 6inch. 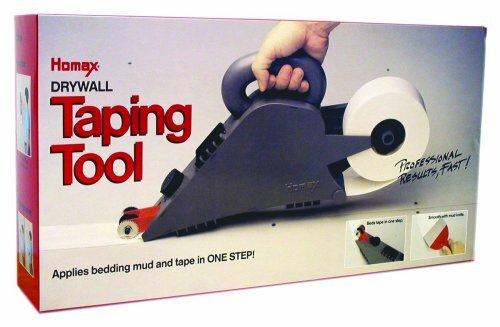 Most helpful set for wall fixing. High quality:Baldes are made of high quality stainless stell,durable and flexible. Handles are made of high quality durable PP+TPR. The holes in each handle for easy storage on any nail or pegboard. Great for puttying windows, removing loose putty, scraping paint, removing loose paint, removing vinyl or paper wall covering, patching dents cracks holes in plaster. Notice:Put it where children can't reach it to avoid danger. TOP-OF-THE-LINE PUTTY KNIVES | A precision hollow-grind provides proper flex point midway up the stainless steel blade (versus near the handle). The blade feels nicely broken-in from the first moment you use it!. This means better feel for faster application rates, optimum blade control and smoother finishes. Polished for easy cleanup. Durable metal alloy hammer head for setting drywall nails. PREMIUM MUD PAN | Rigid 21 gauge (0.0315), polished stainless steel. Heli-arc welded end caps provide outstanding strength and water-tight seams. 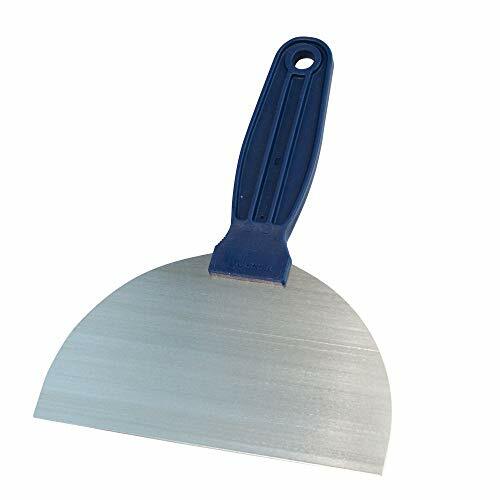 Straight, sheared edges for fast, easy and clean putty knife swipes. Seamless inside corners so no material can collect. Available in three lengths: 12 14 and 16. ERGONOMIC HANDLES | Lightweight full soft comfort grip handle ergonomically designed for all day use with minimal fatigue. Glass reinforced nylon core. Impact and solvent resistant. GUARANTEED PERFORMANCE | Our finishing tools are developed by professionals for professionals and guaranteed to exceed your expectations. If for ANY reason you aren't pleased with your purchase of this putty knife, returns through Amazon are easy and free. 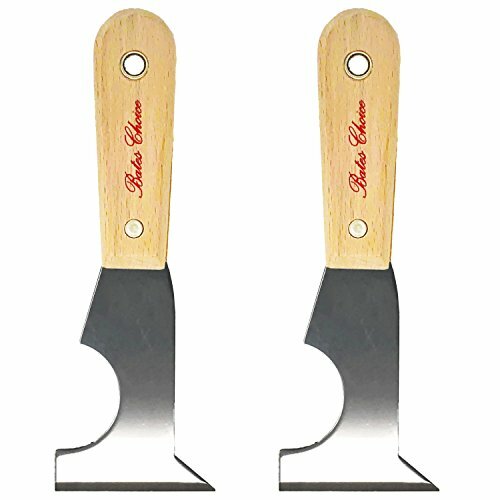 PUTTY/TAPING KNIVES - High-quality polished stainless steel blades feel nicely "broken-in" from the first moment you use it! This means better feel for faster application rates, optimum blade control and smoother finishes. Lightweight full soft comfort grip handle ergonomically designed for all day use with minimal fatigue. Handles riveted into blade backs and with a pull force of over 500lbs. Glass reinforced nylon core. Impact and solvent resistant. ALL STAINLESS STEEL KNIVES COME WITH A LIFETIME MANUFACTURER'S WARRANTY, THE BEST IN THE INDUSTRY. HIGH-CARBON STEEL - Hardened and tempered to keep blades sharp for a long service life. Plated for corrosion resistance. This kit's carbon steel products include the 9-in-1 Multitool, 6-Inch Jab Saw, and 32-Inch Mixer. Level 5 precision blades are sharp. Store your tools out of reach of children! 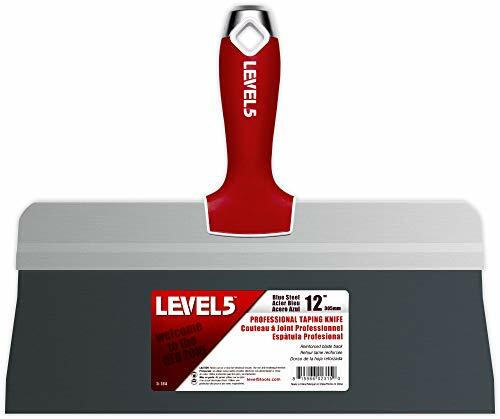 A proud, family-run company based in Kansas City, Level 5 Tools has been perfecting its line of drywall tools since 2001. At Level 5, we do business the old-fashioned way: zero compromises in quality, fair prices, industry-leading warranties, and the relentless pursuit for 100% customer satisfaction. Our extended family includes thousands of professional finishers throughout the USA and abroad. Their livelihoods depend on the quality, performance and reliability of our drywall tools. Through their valued feedback and a culture of ongoing research and innovation, we make the tools that make their lives on the job easier, more efficient, and ultimately more profitable. 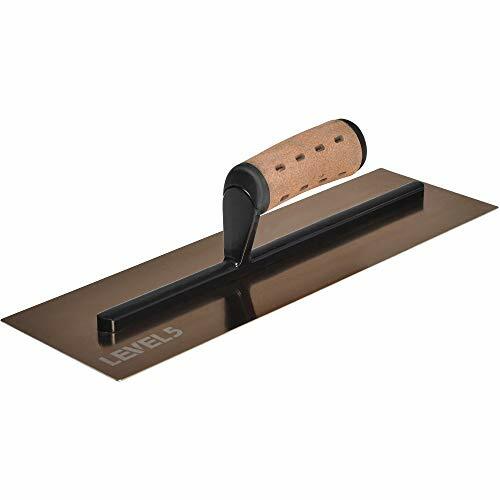 Edward Tools Drywall Outside Corner Tool with ErgoSoft Handle is the ideal outside corner drywall tool for finishing your drywall corners. Made of high grade stainless steel, this corner tool flexes for that perfect 90 degree finish. The ErgoSoft grip handle allows for more control and less hand fatigue. Like all Edward Tools drywall products this corner tool comes with a lifetime warranty. Level 5 drywall tools are premium grade, perfected for both the professional and for home improvement DIY projects. 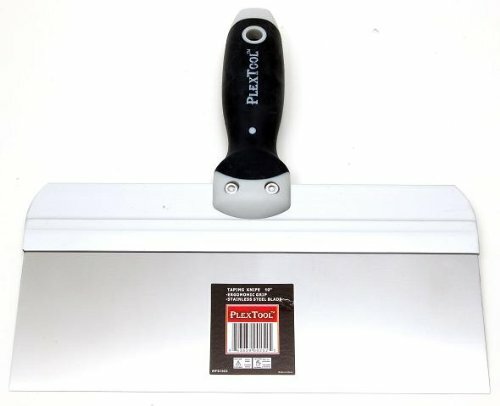 This putty knife is designed and built using nearly 20 years of input from professional finishers. KEY PRODUCT FEATURES - Wider, thicker, and stronger blades in comparison with traditional designs. - High quality, stainless steel blade will not rust and is mirror-polished for easy cleanup. - Ergonomic comfort-grip design reduces fatigue and keeps you going longer. - Metal hammer end for setting drywall nails. - Stay organized. All Level 5 hand tools feature large hang holes. Buy this Level 5 knife and compare for yourself. We back all of our tools with the best warranties in the industry and they are guaranteed to exceed your expectations. If for ANY reason you don't agree, returns are easy and free. PRODUCT WARNING LEVEL 5 precision blades are sharp. Please store your LEVEL 5 putty knives out of reach of children! 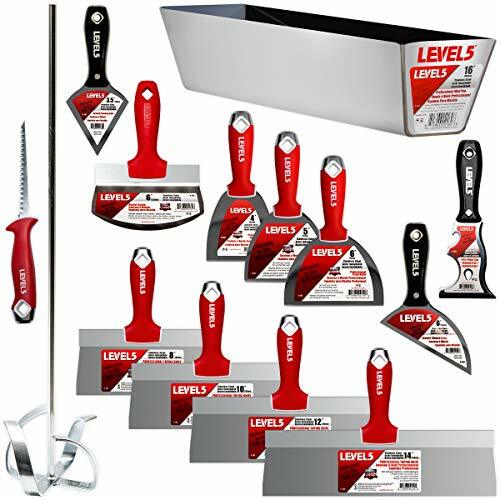 ABOUT LEVEL 5 TOOLS A proud, family-run company based in Kansas City, LEVEL 5 Tools has been perfecting its line of drywall tools since 2001. At LEVEL 5, we do business the old fashioned way: zero compromises in quality, fair prices, industry leading warranties, and the relentless pursuit for 100% customer satisfaction. Our extended family includes thousands of professional finishers throughout North America and abroad. Their livelihoods depend on the quality, performance and reliability of our drywall products. Through their valued feedback and a culture of ongoing research and innovation, we make tools that make their lives on the job easier, more efficient and ultimately more profitable. PROFESSIONAL GRADE | Designed and built using nearly 20 years of input from professional finishers. Our tools are meant for reliable, daily use on the job site and backed by an industry leading warranty! PREMIUM STAINLESS STEEL BLADE | Precise flex for a better finish and faster application rates. Corrosion resistant. FULL SOFT GRIP HANDLE | Lightweight, comfortable and ergonomically designed for all-day use with minimal fatigue. Glass reinforced nylon core. Impact and solvent resistant. Double riveted to the blade using stainless steel rivets. OTHER FEATURES | Alloy metal hammer end for resetting drywall nails (also adds blade protection when dropped). Large hang hole. HIGH-PERFORMANCE DESIGN | Time is money. These premium drywall tools are constructed for high performance and efficiency. Finish more drywall jobs faster with Level 5! Steel blade is rust-resistant. The sturdy, solvent-resistant handle is built for spreading or scraping strength and long life. The knife is the solution for paint pros and others who use paint preparation tools, and drywall taping tools extensively. Level 5's patent-pending skimming blades have been developed and refined through years of feedback from professional finishers. Although competitively priced, they are the highest quality line of skimming blades available on the market today. PRODUCT FEATURES - Patent pending extruded aluminum blade back is lightweight, but offers high strength and rigidity. - 0.3mm high quality, high precision European stainless steel blades that are replaceable if damaged or worn. 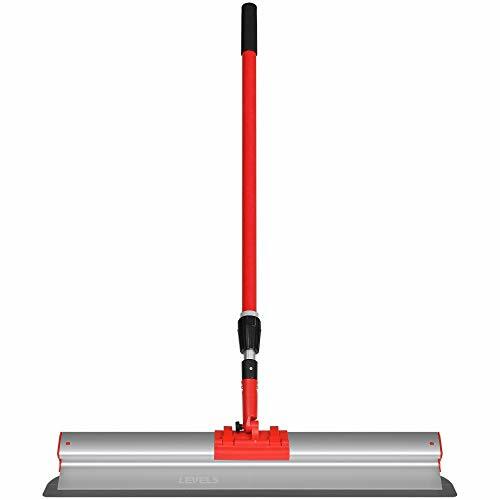 - High impact, glass-filled composite end caps can be removed for quick and easy blade change - 8 lengths available: 7", 10", 14", 16", 24", 32", 40" and 48" PRODUCT WARNING Level 5 precision blades are sharp. Store your tools out of reach of children! 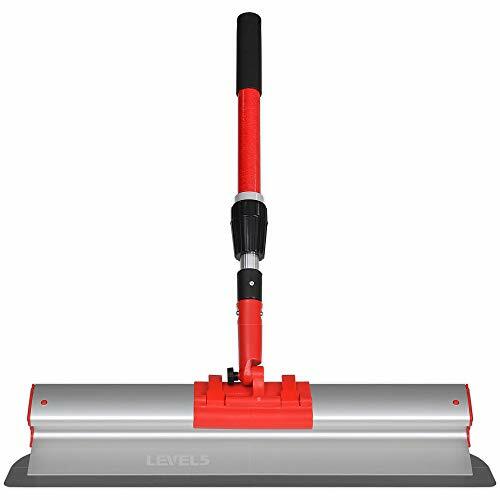 Buy this Level 5 Skimming blade extendable handle with adjustable handle and compare for yourself. We back all of our tools with the best warranties in the industry and they are guaranteed to exceed your expectations. If for ANY reason you don't agree, returns are easy and free. 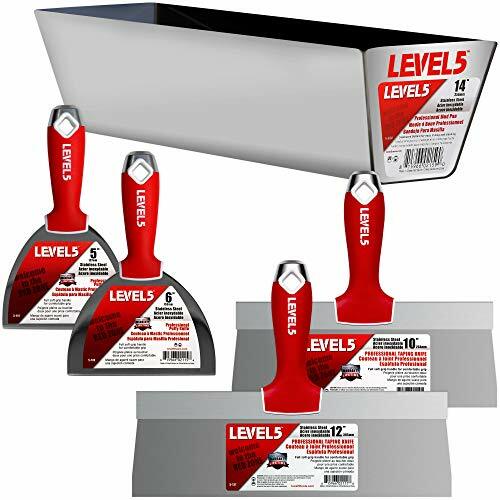 ABOUT LEVEL 5 TOOLS A proud, family-run company based in Kansas City, Level 5 Tools has been perfecting its line of drywall tools since 2001. At Level 5, we do business the old-fashioned way: zero compromises in quality, fair prices, industry-leading warranties, and the relentless pursuit for 100% customer satisfaction. Our extended family includes thousands of professional finishers throughout the USA and abroad. Their livelihoods depend on the quality, performance and reliability of our drywall tools. Through their valued feedback and a culture of ongoing research and innovation, we make the tools that make their lives on the job easier, more efficient, and ultimately more profitable. 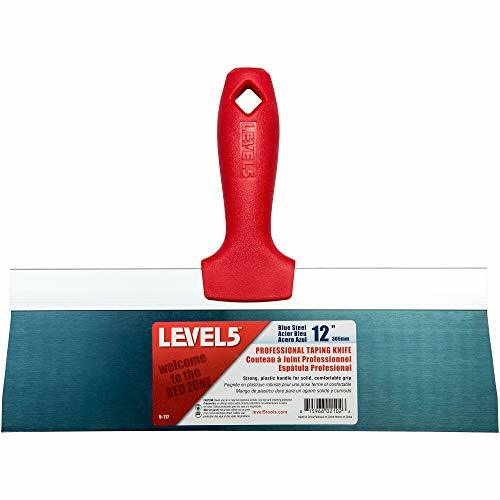 Level5 Drywall Taping Knives are built to the highest standard, designed and manufactured using nearly 20 years of input from professional finishers. PRODUCT FEATURES ~ Premium quality stainless steel blade with perfect, precise flex. Corrosion resistant. ~ Large blade back to hold more mud on the knife.~ Comfortable, full soft grip handle with a glass-reinforced nylon core. Anti-slip. Impact and solvent resistant. ~ Handle double riveted to the blade plate with stainless steel rivets. ~ Rigid anodized backplate that is wider and thicker than competitive models. ~ Alloy metal hammer end for resetting drywall nails. Also adds blade protection when dropped. ~ Easy-peel label. ~ Stay organized! All Level5 Drywall hand tools feature large hang holes. 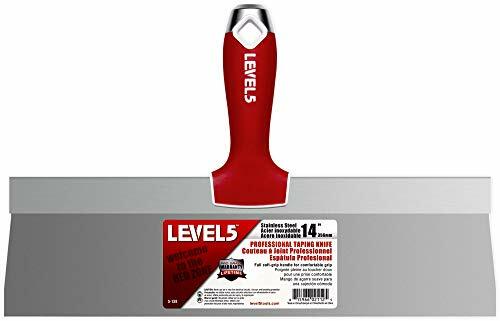 Buy this Level5 Taping Knife and compare for yourself.We back all of our tools with the best warranties in the industry and they are guaranteed to exceed your expectations. If for ANY reason you don't agree, returns are easy and free. PRODUCT WARNING Level5 blades are sharp. Store your Taping Knives out of reach of children! 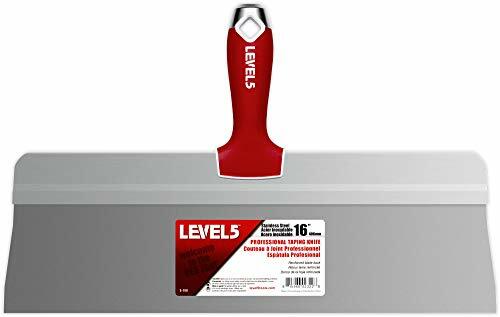 ABOUT LEVEL 5 TOOLS A proud, family-run company based in Kansas City, Level 5 Tools has been perfecting its line of drywall tools since 2001. At Level 5, we do business the old-fashioned way: zero compromises in quality, fair prices, industry-leading warranties, and the relentless pursuit for 100% customer satisfaction. Our extended family includes thousands of professional finishers throughout the USA and abroad. Their livelihoods depend on the quality, performance and reliability of our drywall tools. Through their valued feedback and a culture of ongoing research and innovation, we make the tools that make their lives on the job easier, more efficient, and ultimately more profitable. PREMIUM XL STAINLESS STEEL BLADE | Perfect, precise flex for a better finish and faster application rates. Features a Big-Back anodized backplate to hold more mud. 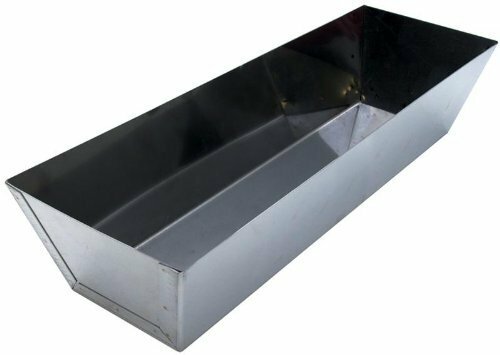 Level 5's stainless steel hand trowels are professional grade. They are lightweight, but offer the sturdy construction professionals demand and will provide years of reliable, all day use on the job site. PRODUCT FEATURES - 1/8" convex curve to the blade. - Triple-hardened premium stainless steel. - High strength but lightweight aluminum handle mount. 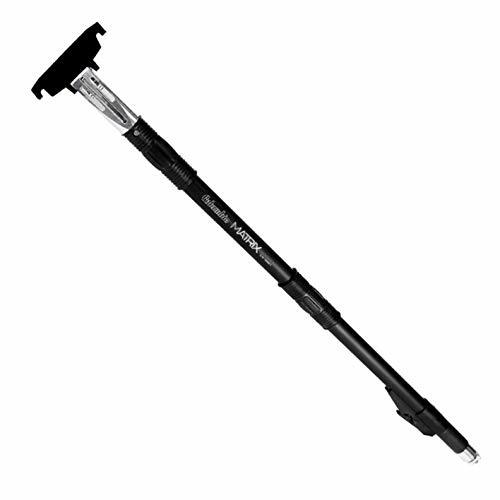 - High impact composite handle core for strength and durability. 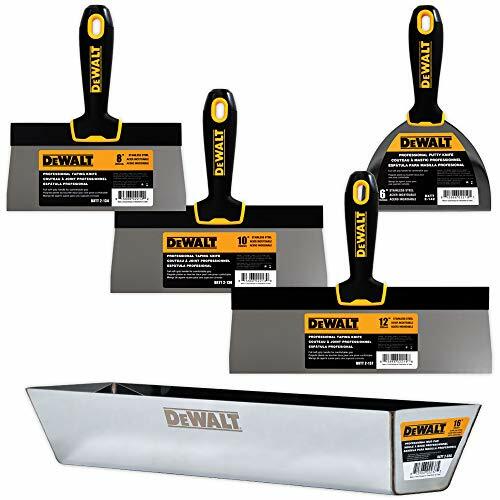 - Width: 4.75" Lengths available: 11.5", 12", 14", 16", and 18" Curved Lengths available: 12", 14", and 16" Buy this Level 5 drywall trowel and compare for yourself. We back all of our tools with the best warranties in the industry and they are guaranteed to exceed your expectations. If for ANY reason you don't agree, returns are easy and free. PRODUCT WARNING Level 5 precision blades are sharp. Store your tools out of reach of children! 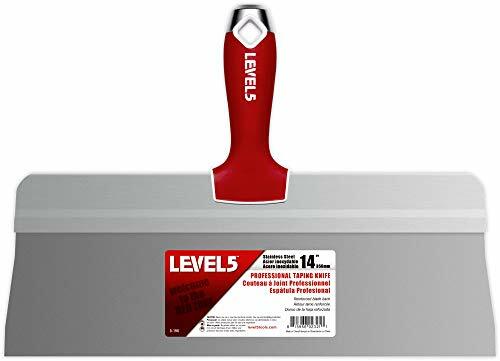 ABOUT LEVEL 5 TOOLS A proud, family-run company based in Kansas City, Level 5 Tools has been perfecting its line of drywall tools since 2001. At Level 5, we do business the old-fashioned way: zero compromises in quality, fair prices, industry-leading warranties, and the relentless pursuit for 100% customer satisfaction. Our extended family includes thousands of professional finishers throughout the USA and abroad. Their livelihoods depend on the quality, performance and reliability of our drywall tools. Through their valued feedback and a culture of ongoing research and innovation, we make the tools that make their lives on the job easier, more efficient, and ultimately more profitable. PREMIUM QUALITY | 1/8 Concave Curve. Triple-hardened premium stainless steel with high precision-ground, pre-broke edges and corners. Super-strong surface-mounted rivets last longer than through-rivet designs. PROFESSIONAL GRADE | Designed and built using nearly 20 years of input from professional finishers. GUARANTEED PERFORMANCE | Our finishing tools are developed by professionals for professionals and guaranteed to exceed your expectations. PRODUCT FEATURES ~ High-quality blue steel for precise flex. ~ Large blade back to hold more mud on the knife. ~ Comfortable, full soft grip handle with a glass-reinforced nylon core. Anti-slip. Impact and solvent resistant. ~ Handle double riveted to the blade plate with stainless steel rivets. ~ Rigid anodized backplate that is wider and thicker than competitive models. ~ Alloy metal hammer end for resetting drywall nails. Also adds blade protection when dropped. ~ Easy-peel label. ~ Stay organized! All Level5 Drywall hand tools feature large hang holes. Buy this Level5 Taping Knife and compare for yourself. We back all of our tools with the best warranties in the industry and they are guaranteed to exceed your expectations. If for ANY reason you don't agree, returns are easy and free. PREMIUM XL BLUE STEEL BLADE | Perfect, precise flex for a better finish and faster application rates. Features a Big-Back anodized backplate to hold more mud.